Kemtile is the exclusive UK applicator for Kagetec Tiling Systems, a high-performance tiling system engineered in Germany by Van Koetsveld & Grimberg GmbH. The Kagetec basic system is the equal of, if not superior to any vibration fixed tiling system available in the UK. Kagetec GFK is the system that is used on the majority of Kemtile projects. The combination of vibration tiling and a plastic mesh reinforced epoxy adhesive layer between the tiles and the bedding medium makes the GFK system one of the toughest floors available. Every tile is encased in epoxy resin. If the grout is damaged the tile bedding is protected. It is ideal for very wet areas due to its totally impervious substrate. A typical Kagetec GFK floor is between 80 and 90mm thick including the tile. 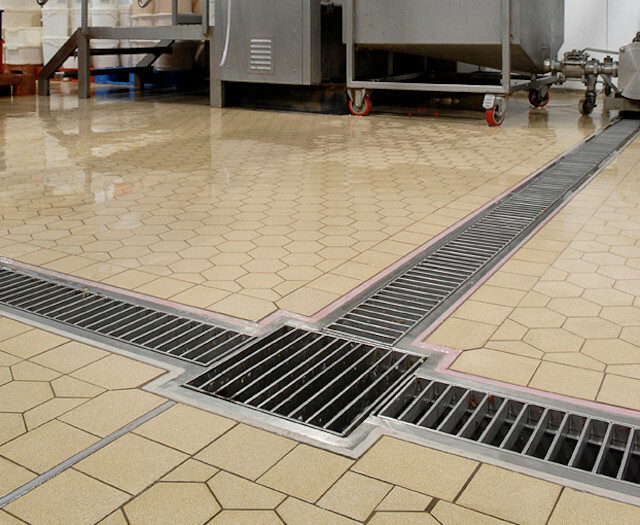 Kagetec Basic System is an economic and hygienic tiled floor system featuring quick installation and high mechanical and load-bearing properties. Kagetec AR is able to withstand the extremes of thermal, mechanical and chemical stresses. It is laid directly onto power floated concrete slabs which results in a minimum increase in floor levels. Kagetec Anti-Static System is designed specifically for use in industries where build up of static electricity must be avoided, such as pharmaceutical or electronics industries. Kemtile has been working with Argelith since 2007 and enjoys a strong relationship with the German company. Argelith's classic hexagonal tiles are extremely dense and vitrified, making them durable with very low water absorption, which makes them the ideal choice for hygienic environments such as food and drink manufacturing. What colours are your resin floors available in? The standard range of Ucrete polyurethane flooring is available in eight colourways: red, yellow, orange, green, cream, grey, green-brown, and blue. What colours do the tiles come in? Argelith ceramic tiles come in a limited colour range as the tiles are made from naturally occurring clays. Will the floor withstand the weight of fork lift trucks? By working with only the highest quality suppliers, all of the flooring systems that we install. 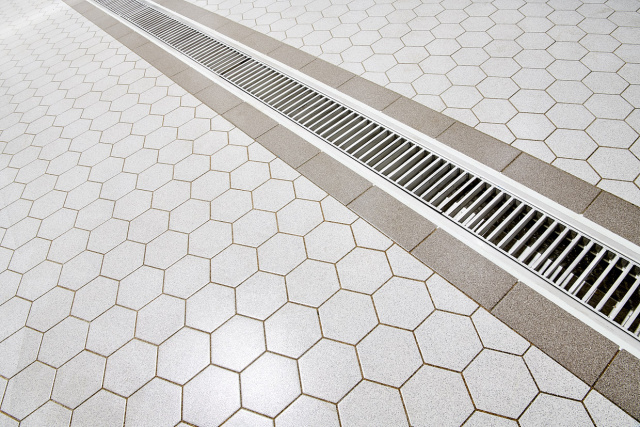 including drainage channels. are able to withstand the most rigorous manufacturing environments. This includes the constant wear and tear of fork lift trucks along with trollies, kegs and barrels, for example. We provide bespoke cleaning recommendations for both resin and tiled floors as all applications vary. Can you provide a floor that can be removed easily at the end of my lease? For many of our customers, especially breweries, flooring and drainage specification is dictated by lease agreements, which usually stipulate that premises must be left in exactly the same condition as they were upon arrival. As most premises have a concrete floor, itself not able to withstand the demands of the rigorous brewing process, flooring is a necessary investment. We usually recommend our Kagetec ceramic floor tiling system in these situations as it is easier to remove than Ucrete resin. Can you overlay resin with tiles? Yes, we can, but each case is determined individually, and a site survey is required to determine the suitability of the underlying cement flooring as a base. Is there a strong odour when installing flooring systems? Generally, not. We always try to use low odour, non-taint products where possible due to the environments that we work in. What size gully do I need? The size of gulley would be determined by a site survey. It is usually determined by flow rates and size of outlet. What size channel do I need? The size of channel would be determined by a site survey. It is usually determined by flow rates and size of outlet. We always try to respond with a quote within seven days. Is there a minimum size for a flooring projects you undertake? No, there isn't. No floor is too large or small.